The popular Bundled Combination Program takes tried-and-true Proven Winners varieties and creates tried-and-true recipes that are easy for the grower and loved by consumers. 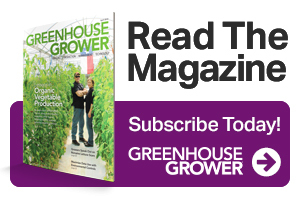 Greenhouse Grower talked to Angie VanWashenova, Internal Sales Supervisor at Four Star Greenhouse, about future plans for the program, the introduction of the 104-size trays, and her personal favorites. GG: What is the Bundled Combination program, and how long have you been offering it? AV: The Bundled Kit program was built to take the guesswork out of combination planting. The recipes are trialed and tested and ultimately selected for their ease of growing for the grower, which results in a beautiful container for the consumer! This is our sixth year offering the program, and as our sales have doubled over the past two years because growers have been so successful with it, we believe we will continue to see growth with this program. We have also made the decision to discontinue our Streamliner program, since the Bundled Kit program is far superior for both the grower and the consumer. GG: What makes the Bundled Combination program stand out from other combo programs? AV: The superior genetics of the Proven Winners® varieties, paired with the extensive trialing of the combinations to provide a recipe that can successfully be grown and perform all season for the consumer, make for a great combo program. 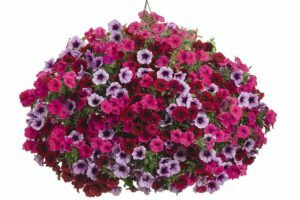 Garden performance continues to be the number-one selection criteria in all Proven Winners plants, and combinations designed with those superior components will certainly stand above other combo programs. GG: This year, the Bundled Combinations are being shipped in 104 Liner trays. Why the change from 84 Liners? AV: As our bundled kits derive from three full trays of each variety, it was a natural transition to have our kits comprised of the 104 Liners as well. The introduction of the 104 Liner last year was met with strong demand and positive feedback from the growers. We saw no difference in the quality of plugs, or the finished times when we moved exclusively to a 104 for the 2018-19 season. With an additional 20 liners per tray, our growers realize great savings in freight, gaining 20% more plants for their shipping dollar. With the new 104 Liners, your Bundled Kit will now produce 52 combinations. GG: The program includes more than 300 recipes. How are the recipes developed and chosen? How many new ones are there for 2019? AV: Approximately 75 new recipes were added to the program this year. Our trialing team works on new combinations year-round, experimenting with varieties that grow well together to produce a color combination that will be attractive to the customer. GG: What feedback do you receive from growers? What do they especially like about the Bundled Combinations? AV: Growers love this program, and we have seen tremendous growth over the last six years. We have made ordering combinations easy, as each kit arrives with everything you need – individual component trays labeled with the variety and combination name, along with 52 combination-specific tags. The specific combo tag eliminates the need for individual stake tags. We label the individual component trays with the combination name to make it easy for the production team to know where the plants go. With over 300 combinations to choose from, our growers can select the right combo for the right season, specific to their region of the country. GG: Why do you think combos are so popular right now? Are there any trends within this category that particularly stand out? AV: Consumers are looking for instant gratification, and by purchasing a combination, they are already half way there! 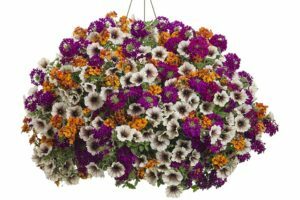 Consumers have extremely high expectations when it comes to the containers (patio pots or hanging baskets) they purchase and expect the components to play well together (varieties to grow out evenly) and for the combo to last the whole season! When they purchase a Proven Winners Combination, they can have the confidence that both of those needs will be met, and they will have a beautiful combo to last them the entire season! Trend wise, consumers are looking for a combo that they can put on their porch or deck that is a showstopper, while being unique. We are seeing people experiment with different thrillers, such as tropicals, to give the combo a completely new look! GG: Do you have any personal favorites among the recipes? After all, you’re a consumer, too! AV: I have so many, it’s hard to pick just one!! If I had to select just one, it would be Grand Traverse! The rich dark-red Supertunia® Black Cherry® mixed with the bright Supertunia Vista® Fuchsia and Supertunia® Bordeaux™ make for a beautiful combination with bloom power all summer long! It looks fantastic all season and continues to look great into the fall, complementing those tones as well!